2019 Student Short Film Festival - Friday, March 8th, 2019, 6:00 p.m.
All students are encouraged to make and submit a film! Movies should be created by students (parents or friends can help). Movies need to be under 3 minutes and non-malicious (not making fun of anyone) or violent. Upload your video to YouTube and email link to John Fisher at hijuan@gmail.com by the evening of March 4th. Or bring copy of the film on a usb drive the night of the event. Questions? Contact John 831.325.1656 or at hijuan@gmail.com. Film Festival is free, although donations will be accepted and donated to the Pacific School Parents Club. Festive dress is welcome. Dinner will not be served. Please come fed or with food. Snacks will be sold during intermission. Last year children sat on floor in front of the chairs. Bring blankets if you wish. Adding background music and sound effects makes for a more interesting movie. Adding text, captions or title screens can add a lot to sharing your story. Use fast motion, slow motion, or reverse footage to mix things up. Adding a title and/or credits can be fun. A movie can be made from narrating a collection of still images. There are all different types of short movies to be made. For example: interviewing someone interesting, interviewing a stuffed animal, creating a documentary about a pet, sharing a special day or vacation, shooting video of something interesting or scenic (pretty), mounting a camera on your dog, get creative! 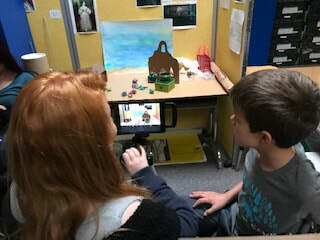 Students making a stop-motion animation. Unfortunately my computer was stolen and some 2018 videos submissions I had were lost. See Adelade's Video here.